Replacing Moshidraw Board with Arduino UNO and GRBL! Air Assist Nozzle K40 Laser! USB Laser Engraver Printer Carver 2000mW DIY Logo Engraving Cutter Machine Tool! Co2 Laser Head Focus Diode Module! CO2 Laser Engraver Cutter Honeycomb Bed! Lab Jack-Stand for CO2 Laser! Single Flute Cutters for Plastic and Acrylic! 3D Print Clean Up Tools! GearBest Tronxy X1 Desktop 3D Printer! Creality CR-10 Super Large 3D Printer! Creality CR-10 Heated Bed Insulation! Creality CR10 Bed Alignment GCode! 200KG Pneumatic Punch Press Machine! K01-80B 80mm 3 Jaw Chucks! GearBest Tronxy X5S 3D Printer Manual! eBay K40 Chinese 40 Watt CO2 Laser! Creality CR10 – Analyzing the Heated with the Flir! Please visit ift.tt/1PJb2UK for more information on this and many other projects! As in this episode, we will be taking a look at the heated bead on the Creality CR-10 3D printer at the request of a viewer as he had a rather good idea! 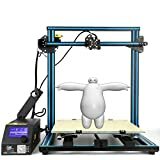 As the CR-10 has a large bed, how does it perform heat wise, is it heating evenly, does it match the temperature it says? Also how hot will it get? These and more questions we will set out to answer using the Flir thermal camera. Also worth note is it is real time from start to 71 deg/C so you get an idea just how long this guy takes to heat up! Get your own Creality CR-10! Check Out the Flir Cameras here! Tags: 3D Printer 3d printer cheap 3d printer for sale cheap 3D Printer Kit 3d printer review 3D prints ABS affordable 3d printer assembled 3d printer Best 3D Printer best 3d printer 2017 best 3d printer under 500 best budget 3d printer best cheap 3d printer big 3d printer Cheap 3D printer CR-10 cr10 Creality Creality cr-10 Creality CR10 flexible filament Gearbest High quality Nylon PLA rclifeon What 3D printer to buy? ← Inkscape Tutorials – Using Layers for 3D Part Design! Shop Talk – Bench Top Rotary Tool Mount! Design Talk – Inspiration and the Ultimate Design? JGAURORA Magic – Stress Tested WIth Success! Design Talk – Creating Hunter Douglas Blind Stands! JGAURORA Magic – Super Easy Detailed Build! Shop Talk – I Have Seen the Light and So Should You! Shop Talk – You Need a Mixing 3D Printer! Shop Talk – Stop Tearing Up Your Build Surface! JGAURORA Magic – Great 3D Printer Starter Kit Unboxing and Discussion! Design Talk – 3D Printing a Topological Map Part 2! Shop Talk – The Ultimate Saw! Design Talk – Easy Way to 3D Print Topological Maps Part 1! Design Talk – Creating My Own Micro Vise! Shop Talk – Nifty Micro Vice! Shop Talk – Filament Drying With a Vacuum Chamber Part 2! Design Talk – Easy Hobby Machinist Centering Jig! Shop Talk – Filament Drying With a Vacuum Chamber Part 1! Design Talk – Amazingly Simple Scale Guides! Biz Talk 101 – Understanding and Finding Markets! Shop Talk – What Are Thrust Bearings! Design Talk – Building the Lazy Machinist V Slot Widget! 3040 CNC – Finding a Replacement for GRBL! 3040 CNC – 3D Printing A Chuck Fixture! Min Lathe – 3D Printed Tool Post Grinder! Shop Talk – Etching Pen Unboxing and Discussion! Design Talk – Blueprint to 3D Print! Biz Talk 101 – Talking About Product Types! Shop Talk – Must Have Dial Indicator Accessories! Biz Talk 101 – Setting Your Price To Sell! Shop Talk – New Aluminum Cutting Blade! Mini Press – Setup and Crushing Something! Biz Talk 101 – Finding Products Not Customers! Mini Press – Unboxing and Discussion! Shop Talk – Nifty Speed Tap! Mini Lathe – 3D Printable Y Axis DRO Mount! Mini Lathe – 3D Printed DRO! Shop Talk – Cutting the Cord to the Shop! Mini Lathe – 3D Printed Carriage End Stop! Mini Lathe – How To Install The Quick Change Tool Post! Shop Talk – How to Preview an STL in WIndows Explorer! Mini Lathe – Must Have Quick Change Tool Post! MicroMill – Disassembly and Discussion ! Shop Talk – Picking a GRBL Controller What’s NEW! MicroMill – Unboxing and Build Notes! GeeeTech A10M – Bed Tramming Dial Indicator Mount! GeeeTech A10M – Mixing Nylon with TPU Fail! GeeeTech A10M – Mixing Nylon with PLA Success! GeeeTech A10M – Mixing Nylon with ABS Success? GeeeTech A10M – Mixing Nylon with PETG AMAZING! GeeeTech A10M – Mixing PLA with PETG Success! Copyright © 2019 DIY 3D Tech. All Rights Reserved. The Magazine Basic Theme by bavotasan.com.